Your U.S. passport needs an expiration date at least 6 months after the last day of our stay. If your passport doesn't have the required validity, you should renew it today and avoid the stress of waiting to renew until the last-minute. Cuba Explorer hasn't sent the General license affidavit for a long time, ever since everything changed under Obama's administration. They do, however, send a Travel Certificate, which is emailed automatically to each traveler as soon as we finish their registration online. Your cell phones won't work in Cuba.. Your cell phone provider does not offer the kind of plan they have if you got to Europe or Mexico - $10 a day for everything. Instead they charge by the call or text. Something like $3 per call - it gets expensive. I recommend budgeting at least $75 a day for spending money. You can turn your CUC's back into dollars or euros either at the hotel or in the airport before leaving Havana. There is internet access in the hotel and they give you a card that will cost 1 CUC - about $1 for an hour of air time. At least at the Riviera that's what the cost is. I assume it's the same as the Capri. It used to be 6 CUC's for an hour of air time. I don't know why they changed it and made it so much more affordable but I like it! You need to buy one of their cards for the air time. You simply scratch out the parts that cover the passwords and other ID, enter them in your tablet or computer and you're off the the races. You might find now that there is no longer any need to scratch out anything - it all appears on the card. Most of our electronics (iPads, iPhones, laptops) are dual voltage meaning that they will operate with either 110V or 220V so it's not necessary to bring a converter. However if you have a device that terminates in a three prong plug you might want to bring one of those cheapie 3 prong to 2 prong adapters. Cuba Explorer arranges taxis for us that are already paid for as transfers on tour dates and included in tour price. They also might have a staff member at the airport waiting for us. The staff member or the taxi driver will have a sign that reads "Cuba Explorer" and will be waiting for us at the arrivals lobby at the airport. They might also be carrying a sign saying "Lisa Dubois Tour".. If asked by Cuban Immigration the purpose of your visit (which I will wager you won't be asked), don't tell them you are conducting research, or engaging in educational, humanitarian or religious activities. You are a tourist on a tour. 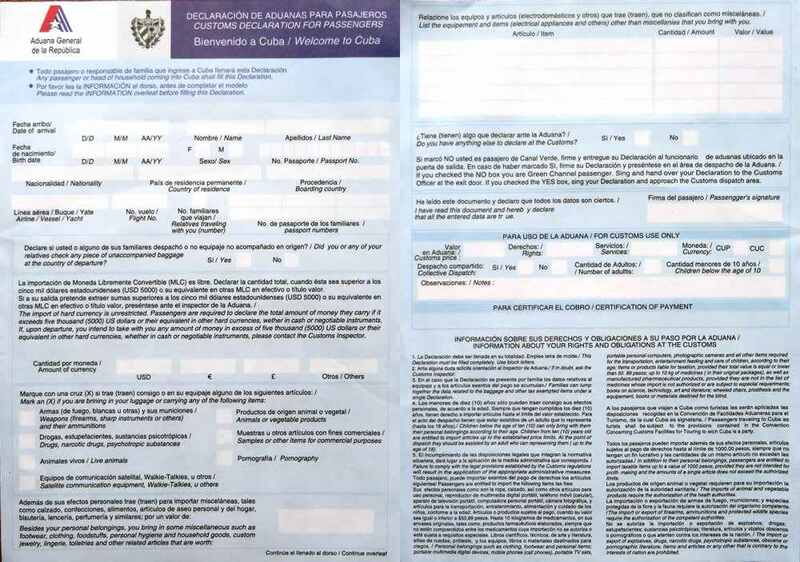 Do not show Cuban Immigration your U.S. travel certificate. It is solely for American immigration when you return to the United States. And they will hardly ever ask to see it. Never have in my experience. Don’t forget your passport and a copy of it as well. Tips are the lifeblood of the service industry in Cuba. People make minimal salaries and depend so much on tipping. Did you know that lawyers and doctors often need to sell items on the street or take second jobs to supplement the $70 a month they earn? And that artists can and often do make more than professionals! • Restaurants (lunches and dinners and breakfasts): 1 to 2 CUC per person. I would recommend leaving 1 CUC per person on your bed before leaving for the day for the hotel housekeeping staff. The streets are poorly lit in the evenings, and we've learned that a small, battery-powered flashlight is very helpful for navigating at night. Be sure to take some extra batteries with you. When you’re ready to leave Cuba for your flight home you can exchange your CUC’s back into dollars at the hotel OR at the airport. Cuba’s climate is subtropical with a mean annual temperature of 77 degrees. Please check the weather forecast before you depart, so that you may adequately be prepared. Average humidity is 78% and two different seasons exist: the dry season (November – April) and the rainy season (May – October). Hurricanes can occur between June & November. Weather conditions closely mimic those found in southern Florida. You’ll find that cotton and lightweight clothing will be the most comfortable. Take some lightweight slacks as well as shorts and be sure to bring comfortable walking shoes. Remember that comfort and convenience should dictate your wardrobe, and casual clothes are in order for most every occasion as you travel. This is what the Cuba Travel Visa looks like. If you’re flying from JFK or any other airport you can buy one right at the Jetblue desk or the check in desk for your airline (AA or whatever) for $50. Fill out both sides. When asked for this they might take 1/2 and give you 1/2 back. On my last trip this year they didn't take any of it - just make sure you have the Visa and can show it to them. If they take 1/2 and give you back the other 1/2 you will hand in the second half when leaving the country. Keep it tucked into your passport so you don’t lose it! The Cuban medical insurance is no longer included because all airlines provide it as part of the ticket, it is mandatory for them, so they will stamp the back of the boarding pass and that stamp is the Cuban medical insurance. 2) the fact that all breakfasts, some lunches and some dinners are included it might not really make such a huge difference based on how much money you will be spending there (bringing back massive amounts of rum and cigars? - bring more money). 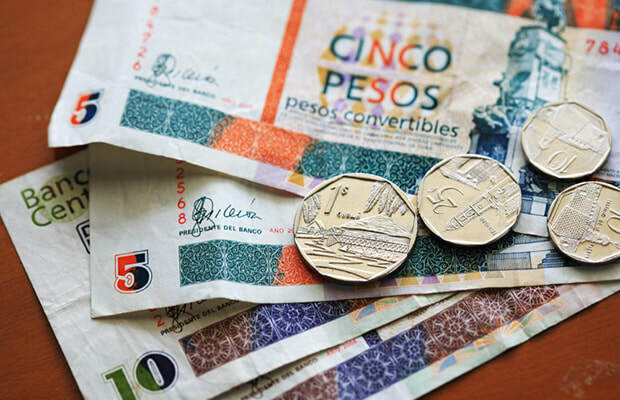 3) no matter what currency you take there will also be a slight loss when you get back to the airport to change your remaining CUC's back into either euros or dollars. This is what the blue immigration form will look like - if you have a choice get the one in English. DON'T FORGET TO ASK FOR THESE EITHER ON YOUR FLIGHT TO HAVANA OR WHEN YOU ARRIVE THERE. Sometimes they just forget to let you know about them! Here is what the travel certificate looks like - print yours out and take it with you .